5:40 into fourth quarter: After Brady passes to Dion Lewis and he fumbles it near the end zone, Gronk recovers it. Initially ruled a touchdown, the call was reversed and the Pats were given the ball at the 1-yard line. Then, Brady passes to Gronk in end zone. 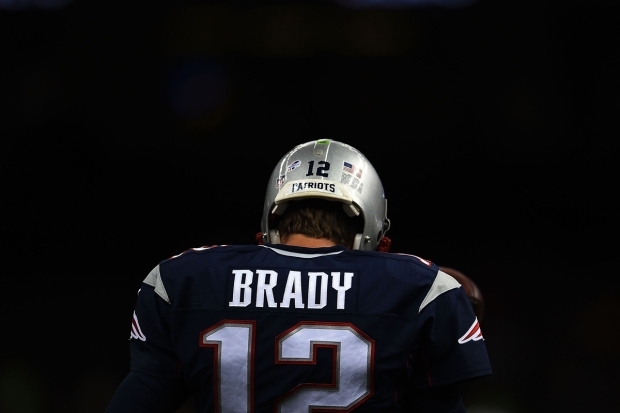 Pats lead 28-14! 3:21 into fourth quarter: Steelers get seven downs in the red zone, but settle for a Josh Scobee field goal. Pats lead 21-14. 8:17 into third quarter: Will Johnson rushes it in from 1-yard line, Ben Rothlisberger hits Markus Wheaton for 2-point conversion. Pats lead 21-11. 4:23 into third quarter: Tom Brady connects with tight end Scott Chandler for another touchdown! Pats lead 21-3! 14:57 into second quarter: Josh Scobee makes first successful field goal in three attempts. Pats lead 14-3. 10:59 into second quarter: Brady hits Gronk in the end zone on a play-action pass! Pats lead 14-0! 3:49 into second quarter: Tom Brady connects to Rob Gronkowski, who easily takes it into the end zone. Patriots lead 7-0! After a long offseason, the New England Patriots' fourth Super Bowl banner was unveiled at Gillette Stadium Thursday night before the reigning champs faced the Pittsburgh Steelers. The fans had their first chance to shower quarterback Tom Brady with adulation since a federal judge vacated the four-game suspension he was handed in the NFL's botched "Deflategate" investigation. The team showed its excitement over social media, where it shared videos of players running out onto the field. Seven months after claiming the franchise's fourth NFL title, the Patriots return to the field for the season opener against the Pittsburgh Steelers in the league's annual kickoff game. Even for a team that's made its reputation on avoiding distractions, the competition will provide a welcome relief from a summer of talk about deflated footballs and the ideal gas law. "It's time for me to do my job," Brady said this week when he spoke to reporters for the first time since the news conference for his third Super Bowl MVP award. "Anything that's happened over the last seven months really wasn't my job. This is what my job is, is to go out there and try to be a great leader for our team, to try to go out and execute the plays that are called and execute them at a high level. That's where my focus is." 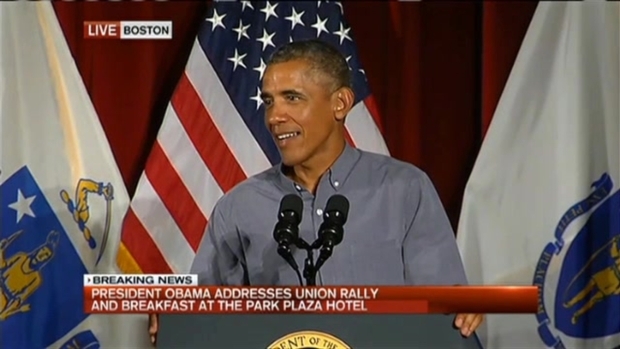 In his remarks, Obama referred to the city's most popular union member, New England Patriots' quarterback Tom Brady. Brady's four-game Deflategate suspension was successfully challenged in court last week by the players' association. "I still have a ton of respect for Tom. I think he is the best in the business. If you want to be the best you have to beat the best," he said. "Yeah, of course one part of you doesn't want him out there because he is the best in the world, but a bigger part of you as a competitor wants him out there because he is the best." BANNER NIGHT: The Super Bowl banner has already been raised, but it remains covered. The three previous championship banners have been moved, and the Patriots removed the one dedicated to their 16-0 regular season in 2007. Team president Jonathan Kraft said during the broadcast of the Patriots' exhibition finale that the team would have postponed the ceremony if Brady was suspended for the game. Kraft said the team planned for an alternate banner that would note some of Brady's accomplishments, such as four NFL titles and three Super Bowl MVPs. "Rest assured, Super Bowl XLIX's banner was not being raised if Tom Brady was not on the field," Kraft said. "He needed to be here the first game that that banner existed in the stadium." 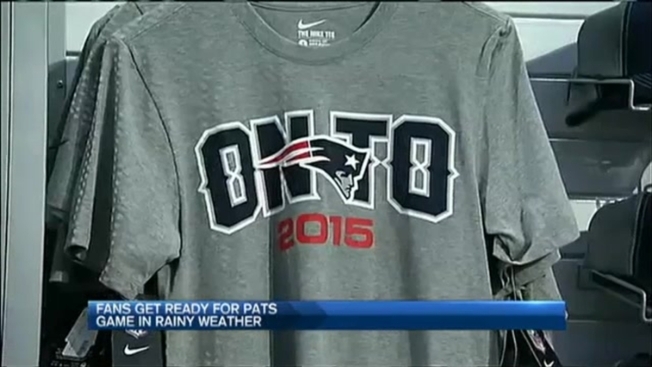 On the Business Beat, Peter Howe discussed the Deflategate suspension overturn, Mass. health care costs in 2014, Los Angeles getting the US Olympic bid, Tokyo scrapping the Olympic logo amid plagiarism allegations, Google changing its logo, and the California company that created Donald Trump piñatas can’t keep up with demand. COMMISSIONER OMISSION: NFL Commissioner Roger Goodell, the focus of Patriots fans' anger during the "Deflategate" investigation, will skip the opener. "He believes that the focus should be on the game on the field and the festivities celebrating the Patriots' Super Bowl championship," league spokesman Brian McCarthy said. "Goodell has attended the other kickoff games, but does not have a function there that requires him to attend." IN A RUSH: The Steelers promoted longtime linebackers coach Keith Butler to defensive coordinator in January and tasked him with restoring some bite to a pass rush that has been largely benign the last four years. The results during the preseason were uneven at best, though Butler remains confident - even though the Steelers are just 2-7 against Brady during his career and have never beaten him on the road, losing the three games in Foxboro by an average of 20.3 points, including a 55-31 mauling in 2013. "You don't have to cover people if you get to the quarterback," Butler said. "Can we get to Brady before he throws the ball? We'll see. We can't let him throw where he wants to." SUPER SUBS? : Pittsburgh will open the season without three vital pieces of an offense that ranked second in the league a year ago. All-Pro running back Le'Veon Bell is suspended for the first two games, and wide receiver Martavis Bryant is out four weeks for running afoul of league policy. Center Maurkice Pouncey is sidelined until November at the earliest with a left ankle injury. In their stead are the likes of DeAngelo Williams, Darrius Heyward-Bey and Cody Wallace, fill-ins that will need to play more like starters if the Steelers are going to survive the league's toughest schedule.